It's almost hard to imagine a world where our daily items actually last. Practically everything is disposable. Everything from our paper coffee cups to shopping bags, and even items like our computers and furniture. They are built to be the most economical, but are they? Sure they seem relatively inexpensive at first, but it’s hardly inexpensive when you are buying the item every day, week, month or year. It adds up and for the large part it goes unnoticed. We, like most of you, couldn’t help but notice the staggering waste of material and enormous cost that came along with using razor blades. We asked ourselves, is there any way to consistently keep razor blades sharp without creating a whole new set of problems; like the maintenance and time of a sharpener or the cost of batteries to keep a sharpener running, not to mention all the additional costs and packaging associated with the upkeep. EverBlade solves the problem, it is completely self sufficient, requires no batteries, electricity or maintenance. 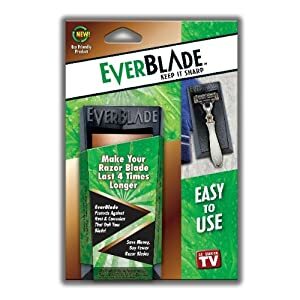 Imagine a single blade lasting you 4 or 6 or even 12 months simply by placing it on the EverBlade stand instead of on your counter or in your medicine cabinet - it's that simple. As we were working hard to solve the problem of a dull razor our research lead us to a collection of unique shaving products that have just hit the market. They are made of concentrate, meaning there is no filler or air, you are buying 100% product that will last you much longer than any of the traditional shaving products. This will save you money over time, you’ll have an amazing shaving experience and will certainly create less waste for all of us. In addition, the EverBlade shaving products do not contain chemicals or alcohol and are made with a natural preservative system. Our goal is to provide you with a product, the EverBlade , that will one day be handed down to your grandchildren, working just as well as the day you bought it, instead of being tossed into a landfill for them to clean up. And to offer genuine shaving techniques that will be pasted on generation after generation, that include a shaving experience free of chemicals and alcohol that irritate, dry and prematurely age your skin. They are so confident in the benefits of the EverBlade products that they offer you a 30 day money back guarantee on all purchases. WOW, talk about making a razor everlasting! I've had the same razor since I starting using the everblade & just decided to throw it away for sanitary reasons last night. I've noticed ANOTHER benefit of everblade being it helps repel the hair that would normally get stuck inbetween the blades, which I've had problems with in the past. I think this is a great product & would recommend it to anyone! My husband used this product and we were actually in shock! He has really thick hair and his blades normally only last him about two shaves and then he has to use a new one. He uses the Gillette ProGlide razor and the refill blades are about $16 for a pack. They are so expensive that he tries to make them last for as long as he possibly can, but even with doing that, he still only gets a few shaves out of them. Since he started using the EverBlade, he has been on the same razor and has shaved so far six times!!! That is just insane!! We are thoroughly impressed and are looking forward to how long he can make this blade last. For this one blade to last six times, that is already unheard of for him, so this is a winner to us. We definitely recommend this product and would love to give an update in the near future on how many more shaves he gets out of this blade!! The price to me is great! I think it is very much worth it for the length of time that the blades last, it does pay for itself very quickly!